Laser scar removal uses non-ablative fractional erbium laser treatments to decrease the size of scars, smooth scars, and to turn red raised lumpy scars into more cosmetically acceptable fine white scars. Laser scar removal treatments work by building new healthy smooth collagen to replace excess, disorganized lumpy collagen in scars. How is a laser scar removal done? The most effective laser scar removal technique involves the use of non-ablative 1540 fractional erbium laser resurfacing. The laser is placed on the scar and laser energy is passed through the skin into the scar tissue to smooth and reorganize the scar collagen into an acceptable scar. What is the best laser for scars? Unequivocally the most effective and best laser scar removal treatment is the 1540 non-ablative fractional erbium laser. This is the most effective and best laser for treating scars that I have used in over 15 years. Yes, the 1540 non-ablative fractional erbium laser does work to return red raised lumpy scars into smooth flat white scars. Multiple treatments are required and usually 3-4 treatments spaced a month apart are required for a good result. Yes, 1540 non-ablative fractional erbium laser scar removal treatments are safe when performed by an experienced nurse, PA, medical aesthetician or physician who is experienced in trained in this technique. Does laser scar treatment work for acne scar removal? 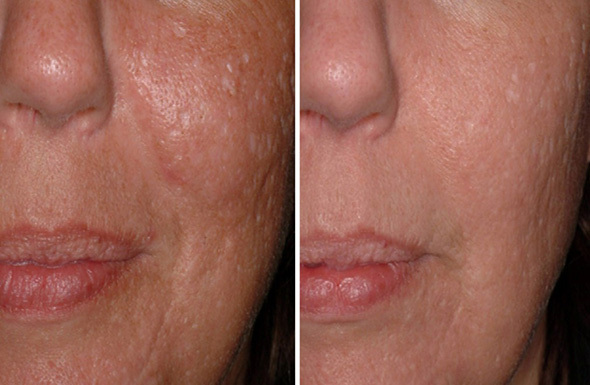 Yes, acne scars can also be treated and improved with 1540 non-ablative fractional erbium laser treatments. There is discomfort during laser scar removal treatment, but most patients tolerate the procedure very well and anesthesia is not required. What will I look like after laser scar removal? The scar and the surrounding skin will be pink to red following the 1540 non-ablative fractional erbium laser scar treatment, but ice packs are applied and the pinkness or redness will go away overnight. How long does it take to see the final result of laser scar removal? 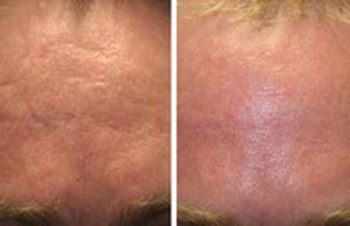 Laser scar removal treatment works by stimulating the growth of new collagen to replace the damaged scar collagen. New collagen production does not start until 6 weeks after the laser scar removal treatment and continues for 6 months to a year. You will need a series of 3-4 laser scar removal treatments, and you will begin to see improvement in your scar about 6 weeks after your first treatment. However, the 3-4 laser scar removal treatments are cumulative and your final scar result will not be apparent until 6-12 months after your last laser scar removal treatment. Who should do my laser scar removal? In Massachusetts a nurse, PA or medical aesthetician supervised by a physician can do your laser scar removal treatments. In some practices, plastic surgeons also perform laser scar removal treatments. Dr. Brooke Seckel of Boston Plastic Surgery Specialists is pleased to offer a wide range of laser skin care treatments, to help patients look and feel their best. In addition to laser scar removal treatments, he provides laser skin surfacing, stretch mark removal, hand rejuvenation and more. If you are interested in learning more about these treatments, or would like to schedule an appointment, call 617-455-2859 today.